One movement work. 16 pages, 8.5" x 11". 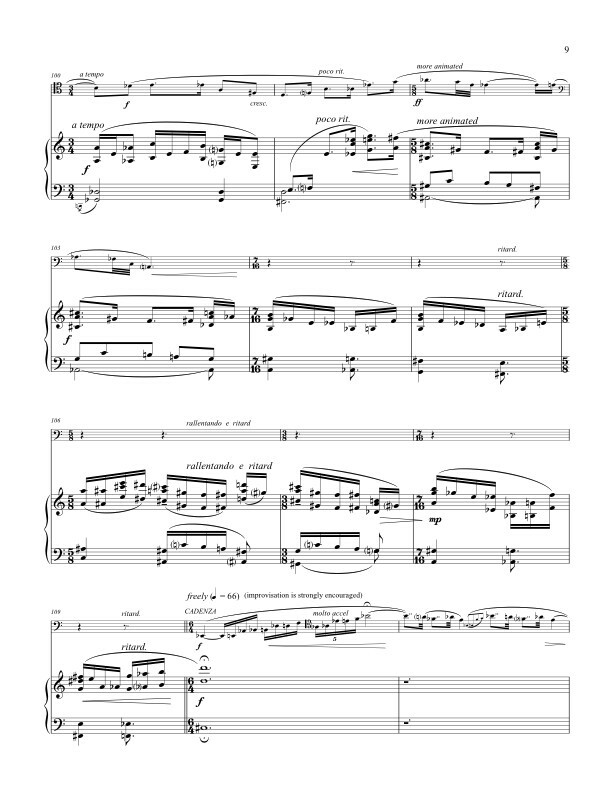 Score and part available from Activist Music for $25.00 print; $17.00 digital. Of Song and Touch is a passionate and exciting piece for a euphonium and piano duo, and offers an adventurous wind player a broad range of music to explore within a single movement. This sonata is an adaptation of my 1999 bassoon and piano work, Of Breath and Touch. Not all pieces lend themselves to new incarnations, but thanks to the interest of Robert Benton, this one turned out to be particularly well suited to the intensities and range of the euphonium. At the time I began composing Of Breath and Touch, I happened to be listening to works by the French composers Ravel, Debussy and Satie as well as to traditional music from Egypt and Turkey. There are unexpected parallels in the types of minor scales used by each country's musicians, as well as between the disparate cultures' use of reed instruments. Western reed instruments are remarkably well suited for some of the long, floating melodies that are often heard in Middle Eastern music, usually played by wind instruments like the ney or the mizmar. While I couldn't easily explore microtonality in a duet that strongly features the all-too-well tempered piano, I did reference the driving rhythms of some Middle Eastern music in a hypnotic and ostinatic piano part that's fun to play, and the reed writing showcases the extraordinary range and tone of the instrument in the hands of a fine player. The result is a uniquely American piece that is informed by other cultures. The title refers to the nature of each instrument, as well as to a more sensual pair of pleasures. 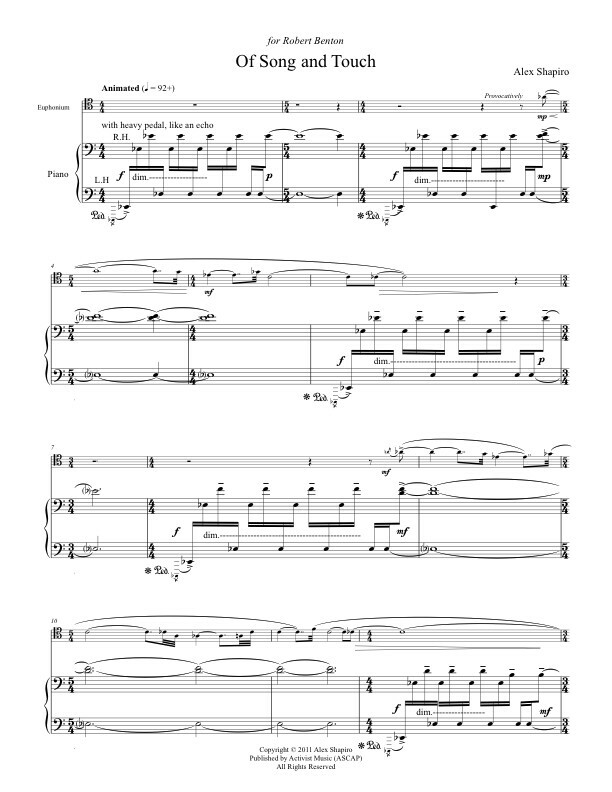 The bassoon and piano version of this piece, Of Breath and Touch, is featured on Carolyn Beck's 2005 CD, Beck and Call, on Crystal Records CD 846. Click CD for more info. "...Alex Shapiro’s short fantasy Of Breath and Touch... This piece imaginatively couples a Middle-Eastern-style moto perpetuo from the keyboard with a melody of long-held notes from the bassoon. Following an introspective central section, it revisits the busy opening as a brief coda." "The disc opener [of Alex Shapiro's] "Of Breath and Touch" is delicate and nervous, like a fine race horse...". "First we hear Alex Shapiro's "Of Breath and Touch." She uses essentially middle-eastern influences in melody, through the bassoon, and rhythm, through the piano. The effect of the ostinato role of the piano, if not the whole piece, is hypnotic. Beck states a somber melody in the beginning then again later in the piece, followed by long sustained passages in different registers that build and recede with intensity. All this is occurring while the piano asserts various harmonies below–sometimes insistently, sometimes agitated, and sometimes as if in a state of delirium." ""Of Breath and Touch" has Middle-Eastern influences, with bassoon chants, plaintive phrases and anxious activity above consoling piano ostinatos...Carolyn Beck explores the full extent of the instrument's character... on this extremely inviting disc." (for Baritone Saxophone and Piano). Commissioned in 2006 by saxophonist Brandon Masterman. Premiered in October 2006 in Youngstown, Ohio by Brandon Masterman, baritone saxophone, and Henry Orazi, piano. Audio clip of "Of Wind and Touch" performed by Brandon Masterman, baritone saxophone, and Henry Orazi, piano. Audio clip of "Of Breath and Touch" performed by Carolyn Beck, bassoon and Delores Stevens, piano.